Are you planning to create a multi-channel marketing campaign to target the drug stores owners, merchandise stores professionals, or other business personnel related to the miscellaneous Retail stores, Blue Mail Media can help you out! 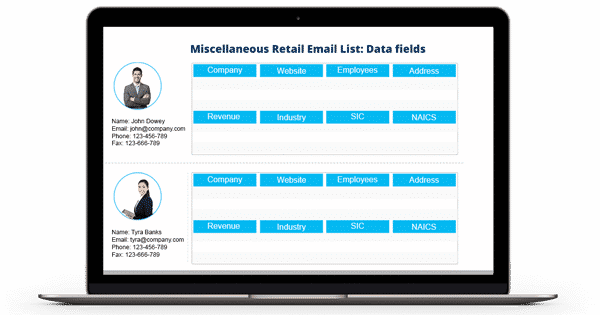 With the Miscellaneous Retail Executives Mailing List, we offer a highly comprehensive contact database of the professionals or businesses related to the miscellaneous retail industry. All the contact records in the list are accurate and verified by using the most trusted sources such as business directories, yellow pages, company newsletters, and government records. Also, we update our database on a regular interval of 2 months so that you can reach your potential prospects successfully. Marketers cannot target their significant prospects if their marketing campaigns are not powered by accurate marketing data. But, finding data that is credible and actionable is a difficult task. Blue Mail Media brings the solution – Miscellaneous Retail Industry List – an accurate, verified, and updated data bank that gives you access to reach the existing as well the potential prospects related to the miscellaneous retail stores spread across the globe. This is a pre-packaged list which you can get customized based on the requirements of your business or multi-channel marketing campaigns. The customization selects that we offer can be – the name of the company, revenue of the company, geographical locations, and more. To add more to your convenience, you can download the double-checked and verified Miscellaneous Retail Executives Email Database in any format.